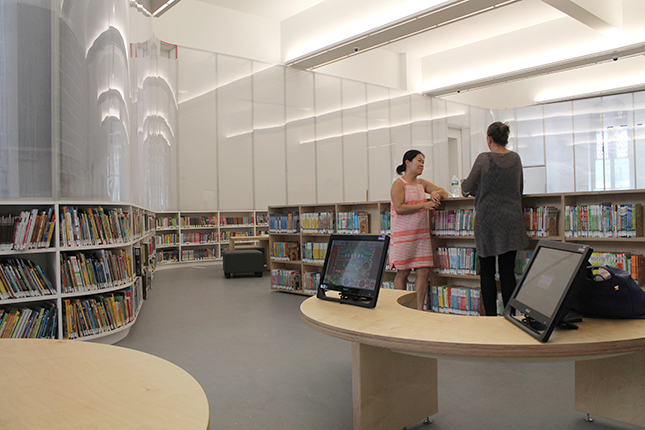 The interim Brooklyn Heights Library is now open at 209 Remsen Street. BROOKLYN HEIGHTS — The Brooklyn Heights Library has opened in what will be its temporary home for the next three-and-a-half years. The interim branch opened Wednesday morning at Our Lady of Lebanon Church, 109 Remsen St., just four blocks away from its permanent location at Cadman Plaza. 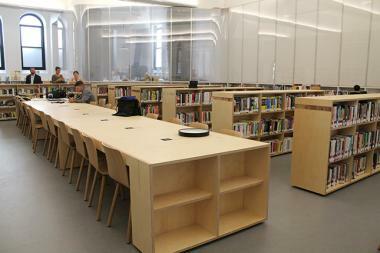 The library, designed by architecture firm Leven Betts, features a curated selection of books, 34 laptops available for check out, a community table with chargers, two desktop computers for children under 5, an adaptable program room that fits about 35 people and a play area for children. The interim branch, which seats about 70 in the main library area, will offer a full range of library services including pre-school story time, after-school programs, live performances and adult-literacy services. There are currently about 17,000 books available at the site — 65 percent of which are children’s books — whereas the permanent library housed about 70,000. 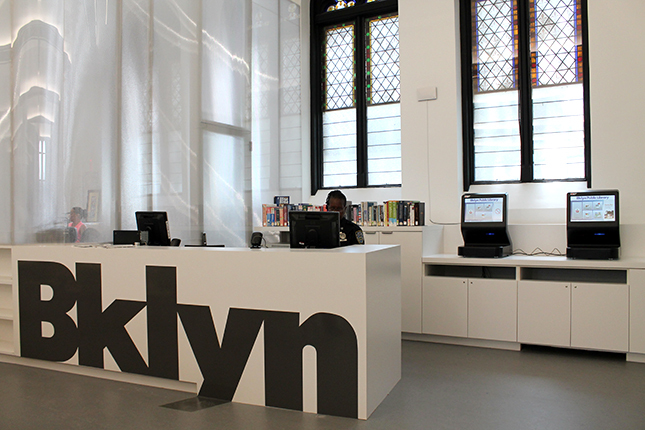 A spokeswoman for the Brooklyn Public Library said residents will have access to any book through BPL’s interlibrary loan system. “You have access to every book in the system right here,” spokeswoman Madeline Kaye said. Meanwhile, a local advocacy group that was behind a recent lawsuit against the BPL has called on the city to investigate whether the church would be censoring material coming into the interim library. “In the past the church has taken a strong position regarding books it considers of questionable moral value and even banned them,” read a letter sent to Mayor Bill de Blasio and other members of the City Council by Love Brooklyn Libraries. The BPL said the church did not play a role in curating the material featured at the interim branch, which is located in what was formerly a social hall for the church. “The collection here is selected by librarians,” said David Woloch, BPL’s executive vice president for external affairs. A representative for the church was not immediately available for comment. The library will operate at the site for the next three-and-a-half years, as developer Hudson Companies builds a 36-story luxury tower at the permanent library site at 1 Clinton St. The new building will eventually feature a smaller library on the ground and basement floors. As part of the controversial library sale, the developer committed to bringing STEM education labs to the high-rise, constructing a 5,000-square-foot library in the DUMBO/Vinegar Hill area, and building 114 affordable rental units in Clinton Hill — at 1043 Fulton St. and 907 Atlantic Ave.
Work on the new building, designed by Marvel Architects, will begin this fall. ► Monday and Friday: 10 a.m. to 6 p.m.
► Tuesday through Thursday: 10 a.m. to 8 p.m.
► Saturday: 10 a.m. to 5 p.m.